Livingtree is your district’s own private social network. This guide will walk you through the basics of your account, and share a few tips for a successful year of engagement on Livingtree! Think of Conversations as your homepage. 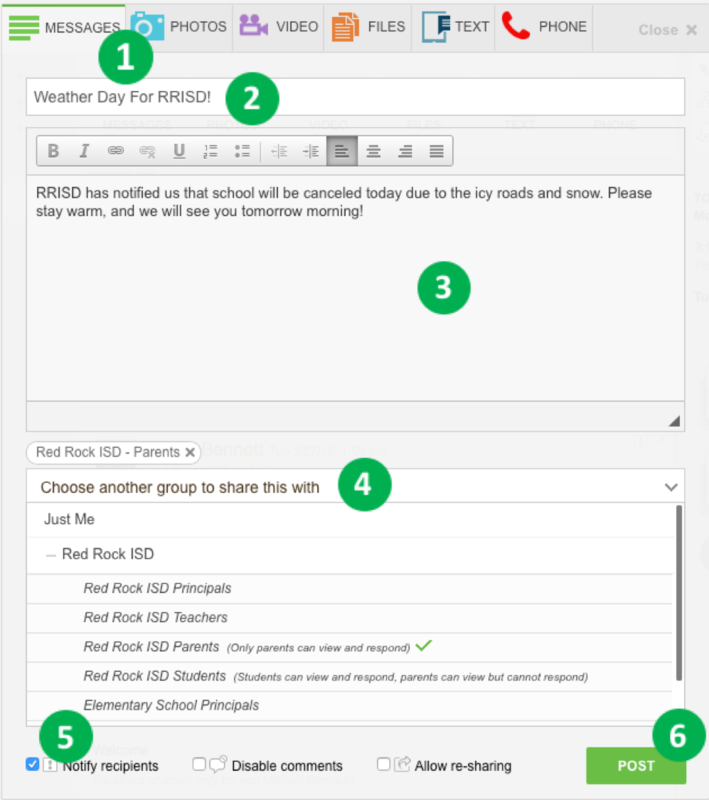 You can share a post with different principal groups, or all staff or all parents in the district. You can also scroll through your stream to view and respond to the posts that have been shared with you. Click on any top navigation application (Calendar, My Network, Inbox, Directory) to explore the functionality. Skip ahead in this guide to read a brief description of each one. Use these shortcuts to access your account settings – ‘Edit Profile & Preferences’ and ‘My Network’ (to edit your groups & connections). Use ‘Edit Profile & Preferences’ to update your information such as email address, phone number, and notification preferences. To see posts translated to one of 100+ languages, select your preferred language. See a quick view of any events coming up within the next two days. Click on ‘Calendar’ to see a day, week, or month view of your Livingtree events. Your calendar will populate with events as they are shared with principals, teachers, parents or students in the district. Jumpstart your community’s Livingtree experience by sharing with your district right away! Recipients will see content that you’ve shared with them when they log in. Click the dropdown menu to select recipients. Scroll down and select your district. The option to share with the principals/teachers/parents/students in your district will appear. Check ‘Notify recipients’ to send notifications for your post. Notifications are sent via email and mobile (through the Livingtree app). You can disable comments for your post, and ‘allow re-sharing’ to allow recipients to re-share your post with their Livingtree groups. * If you have an urgent message to share, click the ‘Text’ tool to send an SMS text message to the teacher and all parents. The text message will also appear in the Conversations feed. If your school or district has opted in for phone alerts, campus or district administrators will see the option to share an alert with the community. View events that have been shared with you, create and share events with your principal, teacher, parent or student groups. Events can include reminders, volunteer tasks, RSVPs, notifications, and more! Manage your organization(s) in ‘My Network’. Use the left navigation to select the group to edit. This is also where you can invite a school principal who isn’t already connected to your organization. Access a complete list of the people connected to your Livingtree groups. Click on your organization to see the contacts in each group. You can click on a contact’s name to view his/her profile or send a direct message.